Take a look at the first picture, left [see figure 1]. It is a photo of me, taking a photo of a hitchhiker. You can see me, holding my iPhone to take my photo of the hitchhiker. You can see them from behind. A thin person, dressed in denim. Hair seemingly in dreadlocks style. You can not see their face, though I seem to be looking straight at them. What was so interesting about this hitchhiker? Why did I want to photograph them? Were they a man or a woman? Did I know them? Where were they trying to go? These are all questions you might well think of, and ask as you view the photo of me and the hitchhiker. The answers to at least some of these questions can be found as you look at the second picture, below [see figure 2]. From this angle, you should be able to see what I was really seeing - and why I took the series of two photos. In fact, there is no real hitchhiker. What there is, is an astonishingly realistic painting of a hitchhiker, as if seen from behind them. The hitchhiker is painted onto a mirror. So, standing at just the right spot, as I did in the first photo, what you really see is my reflection, AS IF I were standing in front of an actual hitchhiker. In fact, I am standing in front of a mirror, with a painting of the back of a hitchhiker on it. It is an artistic deception. The well-known contemporary artist David Hockney once talked on a television show, about his unusual painting of a chair. Rather than a typical illustration, using traditional proportions and angles to convey perspective, Hockney's chair seems like it was painted by a cubist figure straight out of a Picasso painting. 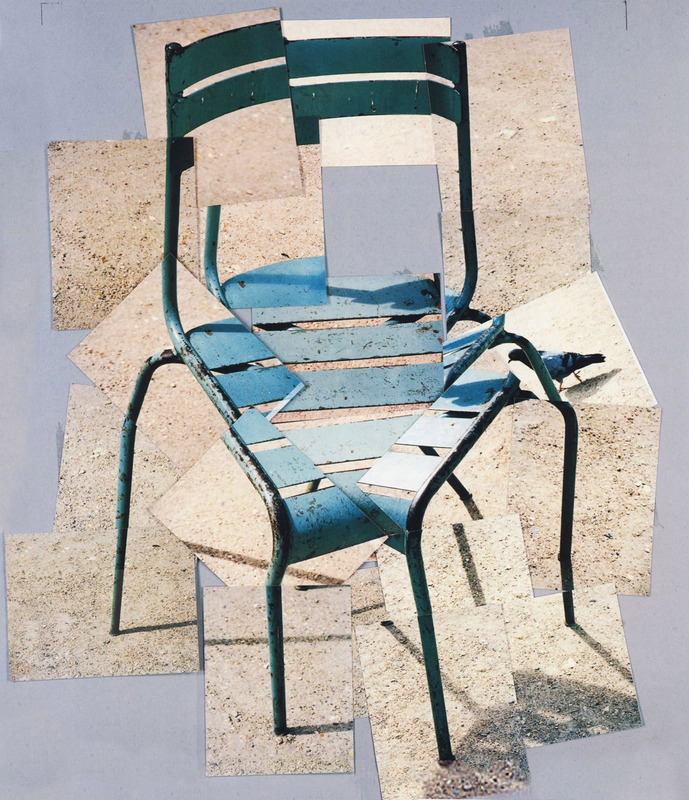 As Hockney explained in 1992, he didn't want to draw a chair. What he wanted was to draw and make a painting of a "walk around a chair." When we are confronted with situations that are challenging, and ambiguous, how do we approach them? How do we perceive them and make sense of what we experience? How do our senses and knowledge limit our ability to understand the new, in the now? How does our human capacity and tendency to seek patterns through comparing the new and now, to the was and then, impact our sense- and meaning-making? A group of merchants and residents from a particular city neighborhood - Cleveland Heights in Cleveland, Ohio - met last week, to talk about how they could grow their businesses and their community (above). As things tend to do over time, their neighborhood had once been THE place to go for hip new restaurants and local culture. But the epicenter of cool has apparently moved elsewhere. We know it is not at all unusual for neighborhoods to experience these natural eco-cycles. The challenge is how to accelerate the revitalization of a once- and hopefully once-again destination community. As with the photos of the hitchhikers, the merchants in this neighborhood will be initially limited by what they know, and what they believe about the dynamics of community revitalization. They are likely small-business owners. Hard workers, whose own success they might likely attribute to their efforts, skills, and perceived quality and value. The merchants have already expressed a desire to control their strategy, actions, and desired outcomes. Are they seeing things as they are? Or are they seeing things the way they'd like them to be? Is there a hitchhiker waiting for a ride, or are we participants in a kind of illusion? You could see the truth about the hitchhiker only by looking at it from multiple angles and viewpoints. You had to suspend your initial judgment and accept the possibility that things were not as they seemed. Only then, could you change your beliefs and perception. That change that enabled new understanding, and new responses to the new, in the now. (Above) You may be interested in, "Making Change One Conversation At A Time" with Bruce Waltuck at I-Open on Vimeo. In times of complexity, we learn to give up our desire for control, which is another form of illusion, and shift from being experts, to become explorers of our own new possibilities.